A bachelor living in Oman is usually much used to eating chicken, and I mean here a lot of chicken. There isn’t much to choose from as 90% of edible food served in casual restaurants around muscat is chicken-this and chicken-that. 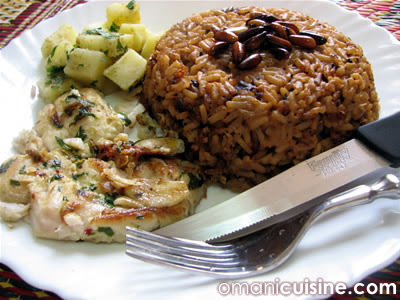 A few restaurants in Oman serve decent fish, and that really is weird when you think about as Oman has a coast that is more than 1500km in length and fish is one of its main exports. Sick of the oil-soaked friend fish served around here, and in hope that our blog does not turn to the Omani Chicken Cuisine, we decided to have fish this time. Hope you like it! Crush the garlic and the green chili. Add the ginger, cumin and the oregano to the crushed mix. Add the olive oil and the vinger to the mix. Get the lemon and peel some of its skin to get the lemon zest. After getting the zest add the juice of the lemon and some finely chopped parsley to the mix. Clean the slices of the halibut fish well then put them in the mix to marinate for one hour. Heat up a non-stick pan. Fry the slices of Halibut with marination mix. Fry the halibut until both sides get red as seen in the picture. Add a little amonut of water to the fish to make sure it is done. mince the onions and fry them in an oiled pot until the onions turn brown (very brown just a degree before they turn black). Add the minced tomato to the onions and keep heating the mix for a while. Add the rice, salt and cumin. Mix the rice with rest of the ingredents well. Add 2 1/4 mugs of water. Give the rice a last stirr then close the lid, leave it for 20 minutes until it is cooked. Fill a bowl with the rice then flip it over on a plate to have the round shape seen in the picture above. Garnish the rice with fried pine seeds. Drain the potato cubes. Minced the garlic and finely chop the parsley. Add the garlic, parsley, vinger, cumin and salt to the potato and mix the will without crushing the potato cubes.